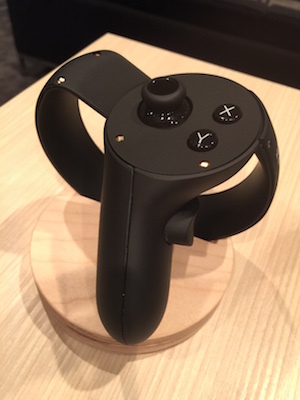 Could the Oculus Touch controller revitalize the Rift? Oculus launched its Rift virtual reality headset earlier this year without its most endearing piece of tech: the Touch controller, a pair of gripped handles that approximate human hands to elevate gameplay from traditional to something truly unique. For the companys vice president of product, Nate Mitchell, the Touchs upcoming retail release represents "a huge next step" for the Rift. "We took a little bit of extra time to get Touch just right," Mitchell said of the controllers delayed debut this fall, more than six months after the Rift began shipping out. "We think it will fundamentally, additively change the experience." A game-changing experience takes time to perfect, he explained. Developers had more years to create content for the Rift itself, but that first wave of games all utilized the Xbox One gamepad as the Touch stayed a bit longer development back at Oculus. Although many of those titles have been highly regarded like platformer Luckys Tale and space shooter Eve: Valkyrie the conversation around the Oculus Rift has perhaps cooled since its high-profile launch. Perhaps thats attributable to the price; the headset retails for a hefty $599.99 and requires a high-end PC to run. There was also controversy surrounding the platforms exclusive games, which Mitchell called a symptom of PC gamers not being used to hardware exclusives like console gamers are. Lately, though, talk about Sony's upcoming, cheaper Playstation VR, what with its 40-million-plus install base, has made the Rift seem like an expensive, tough choice. The Touch stands to change that conversation, Mitchell said. "The stuff that comes out with Touch, you can see its even more creative, more like this next evolution of VR content," he explained. "Thats when developers are really going to have a much firmer sense of the hardware, the software. We know how to do natural, intuitive interactions. All of that stuff is really gonna come together. "If you look at the games that came out at the beginning of Xbox 360 versus the end of Xbox 360, you saw an evolution in terms of game design and better understanding the hardware device," he said as a point of comparison. We tried one Touch-based game at Gamescom 2016, just prior to our meeting with Mitchell. Insomniac Games The Unspoken definitely feels like a more refined, substantive VR experience than, say, VR Sports Challenge. The fantasy action game uses the controller to cast spells, defend against attacks and collect items around a playing field. Our short time with it felt like a traditional game demo with the added benefit of immersion and highly intuitive controls. Projects like this and more are what we can expect from the Rifts second wind, Mitchell told us, and they stand to reenergize a consumer base that might have softened on the Rift. Of course, Oculus doesnt quite see it that way sales numbers are where theyre expected to be thus far, he said. Still, theres always room to grow, and thats exactly what the company expects is going to happen with Touch. "Were getting to the point where its becoming part of mainstream culture," Mitchell said of VR tech. "Has the Rift reached mainstream adoption? Not yet. Weve only had the product out for five months. We think theres a ton of excitement today, but thats gonna amp up as touch does out and the price of PCs come down. "Were working with all of those partners to push innovation forward." Its not just the Rift that needs revitalization. Its VR as a whole. Its in a slump right now due to lack of software. Why were they delayed? Are they looking to add functionality that the Vive's controllers don't have? If so will software developers want to utilize these functions on existing and future games? I guess time will tell. Less segregation the better for VR at this stage I feel. Love the joysticks on the controllers. It will be interesting to see how they work vs the Vive's touchpads. I wish I had room for that. Maybe one day. Can I ask is motion sickness a problem in VR racing games? Or does it boil down to the individuals sensitivity to it. Virtua, I've actually tried as above's seat and wheel setup, and due to the fact that you have a virtual wheel and dash in front of you there doesn't seem to be much motion sickness at all. Oh, and it's fun as hell. I bet it is! I can't wait to try Dirt Rally even though it will be with just a controller. Dirt Rally looks real fun no matter the controller. I seem to remember seeing somewhere the price tag for these controllers is around $200? Have you or anyone you know ever spent $200 on a controller that wasn't custom or modded? Besides If that's the case were now talking around $799 for Rift and that's what the Vive goes for and it's looking more promising, and yet both require a PC VS. the PS VR which is $399 and your all set, my prediction is, Sony is going to be beat out both Oculus and HTC in sales, it's pretty elementary, you get what you pay for but you still gotta have at least a $600 PC to run either PC VR. I'm Just saying. Any sales for VR headset's is a good thing no matter for which company. The present short generational cycle of consoles degrade's their value a great deal for me. I really hope Xbox can change this trend fast. Aiming for 4K is just dumb though unless 60fps is achievable. Maybe the Rift will work with Scorpio and they will have a competitively priced bundle. Consoles are never going to be state of the art again but to be so far behind is a crying shame. I hope the Touch will be i a bundle or something, maybe a pre-order sale o I don't know, paying +$200 for is huge, a lot in VR has to be improved, starting for the price, I just saw a video about the PSVR where the guy spoke about the real price and everything aims to put it in equal price range as the Vive and Rift with a less involving experience, sure I will love to see it by my own or have it but still. I just hope the initial price will be cut soon. I just want to try Medium and see how it compared to TiltBrush! 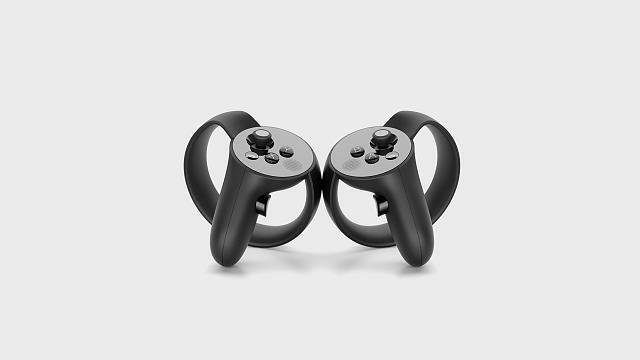 I understand that Oculus was in a rush to be first to market, but I think that leaving out the touch controllers at launch was a bit of a mistake. I do feel that the touch controllers will give Oculus a lift, they probably won't get as high of an adoption rate as they would have if they had launched with them. Other thing I expect is the controllers don't just only work with VR but also for 2D and 3D apps in a regular screen, I don't know what for now, but I'm sure there is a lot to do with it. Yeah but can you used them for 2D gaming? I would think so, since they look like game controllers. I agree and it's a crying shame that most 4K monitors are not even affordable yet, and they are talking about the Scorpio being released next year I doubt the price of 4K will be coming down anytime that soon! I think it might be used for 2D gaming because basically has the same buttons of an XBOX controller but is split in two. Still kinda pricey for a controller, but than again if you just paid $599 for the Rift, maybe not IDK. Do you use a screen protector, and does it distort the VR experience?